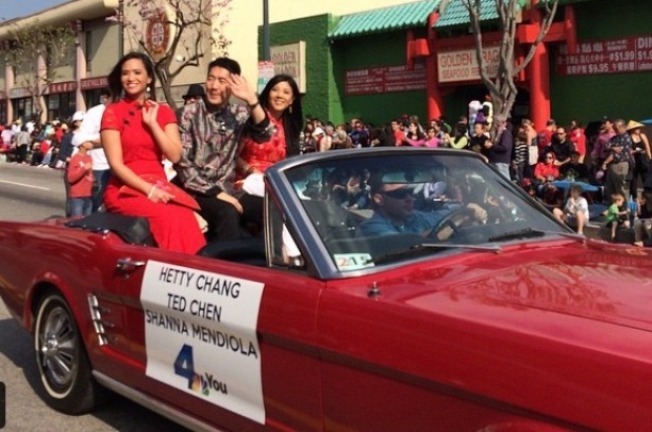 L-R: NBC4 Meteorologist Shanna Mendiola along with NBC4 Reporters Ted Chen and Hetty Chang celebrated Chinese New Year on February 21, 2015 in Chinatown. NBC4 Southern California continues the legacy of supporting important heritage events by participating in the 115th Annual Golden Dragon Parade in Chinatown on February 21 at 1 p.m.
NBC4 Meteorolgist Shanna Mendiola along with Reporters Hetty Chang and Ted Chen participated in the parade while tens of thousands of spectators line the parade route along Broadway to celebrate Lunar New Year. ​​The day of the Lunar New Year is the most celebrated holiday of the year for families of Chinese, Korean, and Vietnamese descent. The celebrations include parades, festivals and large gatherings throughout Southern California. Watch NBC4 News at 5, 6 and 11 p.m. on Saturday, February 21 for interviews and highlights on Channel 4, on NBCLA.com or on your NBCLA mobile app. Look for photos in the NBC4 Community Photo Gallery as well.